We are Leading Manufacturer of Steel Cable Trays from Ahmedabad , Gujarat, India. Our company is the foremost for providing Wire Mesh Cable Tray to the clients. This product is appreciated for being corrosion resistant hence can be used outdoors extensively. Offered range is offered in different sizes, shapes and specifications to cater to varying needs of the customers in most appropriate manner. 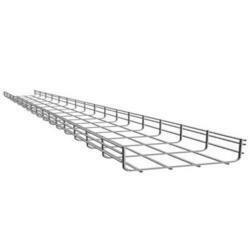 Cable basket trays HVMS-B are used to guide and support vertical cables in free-standing racks between 19" extrusions and side panels. Two types are available, 30 mm deep or 60 mm deep. Get competitive price of Rugged wire mesh cable trays of reputed manufacturers. we can also offer customised cable trays. Wire Mesh Cable Tray provided by our organization are manufactured by using a quality approved raw-materials. These range of products can be available with a very cost-effective price and also can be customized as per our costumer requirements.